LOS ANGELES — The space shuttle Endeavour has landed for the final time, and its new owners can hardly believe that the historic vehicle is now in their hands. Museum officials have been looking forward to today since April 2011, when NASA announced that Endeavour was coming their way. 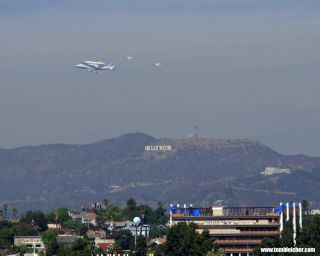 So it feels a bit surreal that the shuttle is finally in LA, they said. "It's pretty incredible, and it's incredibly emotional," Jeffrey Rudolph, president and CEO of the California Science Center, told SPACE.com a few hours before Endeavour touched down. Space shuttle Endeavour, mounted atop a NASA 747 Shuttle Carrier Aircraft (SCA) performs a low flyby at Los Angeles International Airport, Friday, Sept. 21, 2012. Endeavour, built as a replacement for space shuttle Challenger, completed 25 missions, spent 299 days in orbit, and orbited Earth 4,671 times while traveling 122,883,151 miles. Beginning Oct. 30, the shuttle will be on display in the California Science center's Samuel Oschin Space Shuttle Endeavour Display Pavilion, embarking on its new mission to commemorate past achievements in space and educate and inspire future generations of explorers. Endeavour's journey to the museum next month will be special as well. Over the course of two days — Oct. 12 and 13 — the shuttle will travel 12 miles (19 kilometers) through the heart of Los Angeles, providing a memorable and unprecedented sight. "It's going to be an incredible spectacle — the only time ever that you'll see a space shuttle go through an urban corridor like that," Rudolph said. "People are already getting really excited about it." NASA grounded its venerable space shuttle fleet in July 2011 after 30 years of service. The agency is encouraging the development of commercial American spacecraft to take over the shuttles' orbital taxi role while it works to send astronauts to deep-space destinations. In 2010, President Barack Obama directed NASA to send astronauts to a near-Earth asteroid by 2025, then on to Mars by the mid-2030s. NASA wants at least two private vehicles to be ready to carry astronauts to and from low-Earth orbit by 2017. Commercial robotic cargo flights, on the other hand, should start in earnest next month, with SpaceX's Dragon capsule set to blast off toward the International Space Station on its first contracted supply run Oct. 7. While Endeavour will never take to the skies again, it will continue to serve the nation as a museum showpiece, said NASA astronaut Mike Fincke. "People are really going to get a taste of spaceflight, and it's a good reminder that we still have people flying in space, and that we're building a great space future," Fincke, who flew on Endeavour's final STS-134 mission last year, told SPACE.com here today. The shuttle's long history as America's spaceship has left a strong impression on the public that should last for years to come, he added. "You ask any kid from 1970 on to draw a picture of what a spaceship should look like, and they all look like space shuttles," Fincke said. "So it definitely resonates within human hearts."